I was surprised I wasn’t crying yet. I’d been at the doctor for several hours already, been poked and inspected, and had felt as though the ultrasound was the equivalent of going in front of a firing squad. It would be the answer I wanted but feared. Either this baby would be healthy or this baby’s life would have already halted. Instead, there was no baby. There was nothing. “I don’t have all the answers for you,” she said, her voice soft and sincere, “but I’m going to get them.” She reached down and grabbed the black and white image of my empty womb, tore it off the printer and threw it away. When she returned several minutes later with a doctor who specializes in reading ultrasounds, information was fired off like a barrage of bullets. I sharpened my focus to try and understand, but the words fell at my feet. I heard molar pregnancy; placental tissue; a hormonal, placental mess; gestational trophoblastic disease; and D&C. Only minutes before, as I’d undressed in the restroom, I’d repeated Jeremiah 29:11 over and over again: “’For I know the plans I have for you,’ declares the Lord, ‘plans to prosper you and not to harm you, plans to give you hope and a future.’” It was the first verse I’d ever memorized. It’s the verse I’ve claimed for our life since it was first turned upside down after Noah was shaken in 2009. That verse has strengthened and encouraged us through nearly a decade of trials. As I sat on the paper-lined chair next to the ultrasound machine, my sweet friend Robin next to me because my husband was out of town at a men’s retreat, the doctor continued to explain what had happened inside of me for all these weeks I believed I was growing a baby. It should have been about the size of a blueberry by now, with eyes, a heartbeat, and paddle hands. But there was never a baby. I’d been pregnancy punked. Over the next hour of blood work and waiting to schedule a D&C for Monday, I cried in front of more soft-smiling, tissue-holding women than ever before. And I’m no stranger to crying in front of medical professionals. Empathy and compassion encircled me, and I felt loved but heartbroken. I would have to tell my husband now; I would have to tell my boys that the baby they’d been talking about constantly wasn’t there. Only ten days after I felt the Holy Spirit encourage me to get out from under the fear of miscarriage, to put my faith where my mouth is, and to share this pregnancy with the world, here I was: exactly where I’d been afraid to be. But this was different. It was more and less than I could have ever imagined. 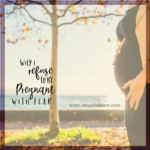 I was so terrified of being 1 in 4 again, of miscarrying a life I was already in love with. And yet here I am now 1 in 1,000 – and there was never any life. I spent the rest of Friday on the battlefield of early grief. I yelled at God. Words came out of my mouth that I haven’t even heard in a long time. I bellowed in anger and hurt. I sat my children down, just the three of us, and I told them my body had been confused and that there was never a baby. The next morning when I reminded my son Avry that our pastor’s wife would be having a baby any day now, and he said, “Lucky her.” Yeah, he gets it. 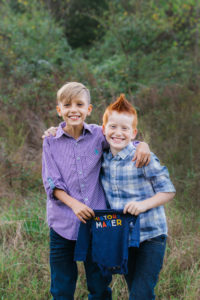 My boys are young and can’t understand all the medical nuances, but they know our family dream of a baby in June is gone. They know I’ll have surgery on Monday. They know Mom is sad. What they don’t know is that if this is indeed a molar pregnancy, which can only be confirmed by a pathology report after the D&C, serious complications are possible, including a treatable kind of cancer. I will likely also need monthly blood tests to ensure my HcG numbers stay low. Because of all this risk, it could be another year before we can try to have another baby. This is the first time in my life I’ve truly felt my age as discriminating against me. First, it was my age that increased my risk of releasing a completely empty egg, which was a partial cause of this mess, and second, I’ll be 39 in a couple months. Time isn’t slowing down – and it won’t pause while I wait for my body to be a healthy place to make and sustain that baby we’ve dreamed about. A couple months ago, before I was pregnant, I was immersed in the story of Sarah, Abraham’s wife. I studied it for days, fixating on Sarah. God promised Abraham that his offspring would become a great nation and that his offspring would be like the dust of the earth and the stars in the sky – too numerous to count. But it would all start with a baby. That’s the common sense element that was elusive for 25 years. 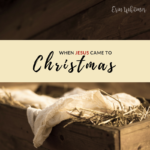 A year before the promise finally came to fruition – and after six more reminders of the promise over those decades – Sarah was old and past childbearing years. She was so over the promise that she laughed at it. She’d grown bitter and doubtful. Her faith was no bigger than the few dried-up eggs she carried in her aging ovaries. But God had a plan. From the beginning of the promise, he had a plan. It just didn’t work out the way Sarah had expected. 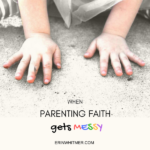 All those baby accessories she bought in faith, all the women she told she’d be expecting soon, the blog post about God’s promise to her – it must have all felt like a joke when it didn’t work out the way she thought it would. Because we take God’s promises and his plans for us and we can’t help but make them our own. Yesterday, one day after this shift in our life, I couldn’t stop thinking of James 1:17: “Every good and perfect gift is from above.” Every. Good. And. Perfect. Gift. What does this mean? God didn’t do this. God didn’t cause this pain. But he knew it was coming. He knew even as he whispered into my spirit to put my faith where my mouth is that there was no baby. The announcement and corresponding blog were acts of obedience, and yet God knew all along I’d be questioning my faith again only ten days later. 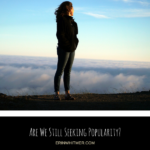 He knew I’d be frustrated that I’d volunteered to be the poster girl for faith in the midst of struggle. But this path was forged from the moment of conception. The plan for this baby could never work. The blueprint was all wrong. It doesn’t matter how many plans we made in the meantime – all the home renovations, the new baby bump-friendly clothes, the announcement photos we took in faith that the plan would be perfect. We told fear to shove it and we moved forward with boldness in every step of our life. Fear didn’t win. But the plans we’d crafted through dreams and faith couldn’t survive either. But every good and perfect gift comes from above. And he knows the plans he has for me. Plans to prosper me. Plans for hope. For a future. That includes the plans for a baby. If ever – and whenever that gift is given to us again. I’m still in the infancy of this unexpected journey, as I go in tomorrow for the D&C to remove what’s left of that baby dream. I can’t imagine yet what God has in store or how he plans on resurrecting this dream he gave me, but I can’t have faith that every good and perfect gift is from him and then doubt all the goodness he desires for me – even when I can’t understand the season of struggle in between the promise and its delivery. I do believe that God will use this loss as a blessing to us and to others. I’ve lived that through every other sadness of my adult faith-filled life; this will not be the exception. I also believe he sets a plan in motion for our good even when it feels as though we’re in the middle of the bad. Because if the world didn’t already know about this pregnancy and now this complicated loss, I wouldn’t have anyone to pray over me, and I need your prayers. I need prayers that this D&C removes all potentially dangerous tissue and that my hormone levels subside quickly and stay down. Thank you, dear friends. Your faith and your prayers are a perfect gift from above. For the related blog post where I announced my pregnancy, check out Why I Refuse to be Pregnant with Fear. It was shared nearly 300 times within two days on Facebook. Have you lost a pregnancy? Trust me, how I know how that unique grief can mark you. So does Adriel Booker, author of Grace Like Scarlett. Adriel had three miscarriages, and from that deep loss, she learned how to seek the Lord for comfort and hope within that season of grief. 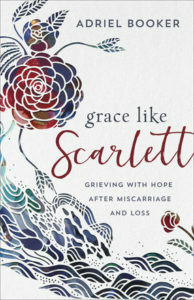 In Grace like Scarlett she shows us each how to mourn without losing our sight of God and His beautiful promises. You’ll grow to know and love Adriel like a close friend. If you’ve experienced loss or you know a friend who has, I encourage you to purchase this book. « How Are We Condemning Our Christian Friends Instead of Encouraging Them?